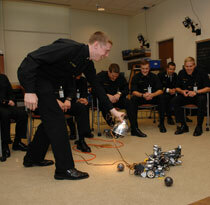 Welcome to the homepage of the Weapons, Robotics, and Control Engineering Department at the United States Naval Academy. The department is the home of the Robotics and Control Engineering Program, most recently accredited by the Engineering Accreditation Commission of ABET under the title Systems Engineering. The program's educational objectives, student outcomes, and enrollment and graduation data are provided here . The Department can trace its lineage to the course of lectures on Naval Ordnance and Gunnery delivered by Lieutenant J. H. Ward at the Philadelphia Naval School (an academy for midshipmen that was a precursor of the Naval Academy) in the year 1844. In 1962, the Department of Engineering offered an elective course entitled “Systems Engineering” and the Weapons Department offered “Advanced Weapons Systems Engineering,” for which the textbook was Systems Engineering. Today, the Department serves the Academy by offering: a Robotics and Control Engineering Major; an Honors Robotics and Control Engineering major; and required courses on Weapons and Control Engineering for the entire Brigade of Midshipmen. Automatic control and robotics are, by their nature, interdisciplinary. These subjects have grown organically into various engineering departments at institutions of higher learning as the enabling technologies of computing and sensing have matured. At the United States Naval Academy (USNA), where the majors program developed much later in the institution’s life cycle than at peer universities, expertise in automation and control was concentrated in the department that had as its mission the education of midshipmen in regards to advanced weapon systems. From this concentration of expertise came a major with a focus on the design and construction of systems or devices that work by themselves with little or no direct human control. The weapon systems origin of the program also explain why the major differs from those that have the same name at some peer institutions but instead deal with the management of engineering systems and not the design and implementation of hardware and software solutions as does our program. This distinction led to the change in the name of the major in 2018, to its current form – Robotics and Control Engineering. The Robotics and Control Engineering discipline as it is taught in this department focuses on the various aspects of the Sense-Decide-Act cycle, involving the selection, design, implementation, and integration of sensors (from simple switches to the most complex computer vision or RADAR system), controllers (anything from a simple analog circuit to a complex adaptive distributed network), and actuators (ranging from LEDs to synchronous machines and artificial muscles). Application domains range from mobile robotics to biosystems, from cyber physical to power systems and everything in-between. 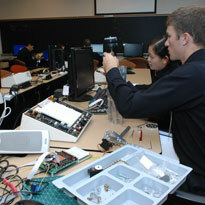 The fundamental aspects of the discipline include sensors, actuators, feedback loops, computing, and computer programming, taught in the sophomore and junior years. In the first class (1/C or senior) year, a Robotics and Control Engineering major will concentrate in two application areas. One of these areas must be offered internally to the department, including estimation and control, robotics (from industrial manipulators to unmanned flying craft), embedded computing (programming portable devices), signal processing (including computer vision), and engineering management. The second concentration can be from this same list or from a set of approved offerings by other departments, including environmental engineering, nuclear engineering, and material science. A final elective course is allowed from any of the available focus areas and from an extensive list of additional options. An honors version of the major exists for exceptional students. The same need for a midshipman's in-depth study also necessitates coverage of the breadth of naval weapon systems found in the fleet at present. Our responsibility is to educate the entire Brigade of Midshipmen on the scientific principles and engineering concepts of sonar, radar, guidance systems, and related military technologies. To teach such specialized topics, the Department relies on a military faculty that is comprised of both junior officers with fresh operational experience and Permanent Military Professors, a community of selected career naval officers who hold doctorates. Our corporate military faculty has authored the textbook Principles of Naval Weapons used by NROTC as well as foreign naval schools. I invite you to take some time to learn about our military and career civilian faculty and their field of expertise, our course offerings, and some of our outstanding student projects. Please "like" us on Facebook to get more frequent updates. 05-NOV-2018: We are excited to announce a new department name along with a new name for our major. The previous Weapons and Systems Engineering Department is now officially the Weapons, Robotics, and Control Engineering Department. The previous Systems Engineering major is now the Robotics and Control Engineering major. The new names emphasize the nature of our academic courses and research programs.